The gospel is not repent or perish; this is the message spoken by men who take our Lord’s words out of context, who focus their attention on the sins of other men. 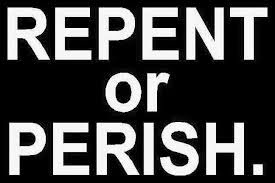 The gospel is not repent and believe, if you then sin you prove yourself to be an unbeliever; this is the message spoken by men who focus within, trying to keep the law after having believed. The gospel is that there is now no condemnation for those who are in Christ Jesus; the law is fulfilled in Christ Jesus alone, God’s requirement for eternal life is fulfilled in Him; He lived a righteous life deserving heaven, He willing took our punishment which is death, to give us eternal life; why would you look any where else but Christ? The law of God is fulfilled in the one who does not walk according to the flesh but according to the Spirit, that is through faith in Jesus alone. Well then, should we go on sinning that grace may increase? We died with Christ when we trusted in Him, He bought us with His own blood, therefore everything that we are is His. Sinning or not sinning is not evidence of your salvation; the evidence of your salvation is; what is your motivation to not sin? If your motivation to not sin is condemnation then you prove yourself to be an unbeliever; Jesus death was payment in full for our sins. The Christian is born again, he is a new creature; the Christians motivation to not sin is His love of God, He hungers and thirsts after righteousness.